Globo TV’s Raphael Corrêa Netto explains the growing appeal of the network’s telenovelas outside its native Brazil. The trend for watching telenovelas in Brazil is as strong as ever and it’s a habit that is spreading to the rest of the world. That’s according to Raphael Corrêa Netto, Brazilian network Globo TV’s executive director of international business, who says investment in and support for new writers, on-screen talent and a willingness to take risks with stories keeps audiences tuning in week after week. “Watching Globo telenovelas is a tradition in the Brazilian culture that remains strong to this day,” he says. “Our plots are audience leaders and are allocated throughout the programming schedule. We have three slots for original productions, another slot for a teen telenovela and a slot for popular reruns. And, a few years ago, we reopened the 23.00 slot for plots with more adult themes. The success of Globo’s output at home continues to be repeated on the international stage through the network’s distribution arm, Globo TV International. Joia Rara (Precious Pearl), the story of two brothers fighting for control of their family’s empire, which won an International Emmy for Best Telenovela last year, recently aired in the US on Telemundo. It was also the second most watched show in Uruguay during its first week on air on Teledoce, and has sold to EPG in South Korea, Armenia Public TV and Mongolia’s TV5. New series coming to the international market include serial-killer drama Dupla Identidade (Merciless), mystery La Fiesta (The Party) and romantic miniseries Amores Roubados (Doomed, pictured top). The Party has already been picked up by EPG, Ecuavisa in Ecuador, Peru’s ATV, Teledoce and Portugal’s SIC, while Doomed is heading to Telefe in Argentina and SIC. Globo is also taking pre-orders for its latest telenovela A Regra do Jogo (Rules of the Game), which debuted in August. Written by João Emanuel Carneiro (Avenida Brasil, or Brazil Avenue), it centres on a former politician who precariously walks the line between good and evil. Brazil Avenue, which follows a woman’s bid for revenge against her cruel stepmother, currently holds Globo’s record for a licensed series, with broadcasting rights sold to more than 130 countries. “Stories involving classic plots of love, betrayal, jealousy, revenge and big secrets remain strong,” says Netto. “What changes is the way in which they are told and the resources used in the scene. All our contemporary stories follow and record the evolution of society and use – as do our period stories and entertainment programmes – technological resources that tell the story in an innovative way. Filming and broadcasting in 4K, for instance, makes watching television even more exciting. “In Rules of the Game, we will debut a new method of shooting a telenovela, which has been studied for the last two years through the collaboration of different departments across Globo. It is the ‘Scenic Box’ (Caixa Cênica) – closed sets that are adapted to allow greater camera integration and to give actors more freedom to play, thus making dramaturgy closer to reality shows in the way images are captured and shown to the viewer. 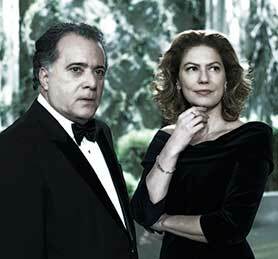 Naturally, Brazilian drama fares best in Latin America, where output deals are in place with Telefe, Mexico’s Azteca, Teledoce, Ecuavisa and ATV, among others. Series also travel across the Atlantic to Portugal and Portuguese-speaking countries in Africa such as Angola, Mozambique and Cape Verde. But with global audiences now more welcoming to foreign-language series than ever, Globo is taking the initiative by targeting new territories further afield. Part of this strategy involves setting up new channels. Netto explains: “In July in Angola and Mozambique, for example, we launched our second pay-per-view channel Globe ON, broadcasting telenovelas, series and comedies that have a place in the hearts of Africans. And we have already been told that the audience ratings registered are great. “We have been gaining more space in the US, where we have had three blockbusters in primetime on MundoMax (formerly MundoFox) and we have telenovelas on air on Telemundo.